Kinston Daily Free Press, 27 December 1918. 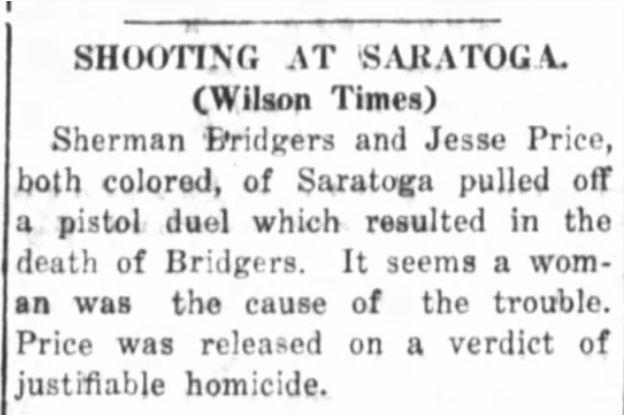 Sherman Bridgers, 21, married Susan Moore, 19, on 25 March 1903 in Saratoga township, Wilson County. Jesse Price, 23, of Stantonsburg, son of William and Susan Price of Nash County, married Hattie Barnes, 22, of Stantonsburg, daughter of Nelson and Ellen Barnes, on 26 December 1906. Nathan, Sidney and Mittie Locust were witnesses to the ceremony. In the 1910 census of Saratoga township, Wilson County: odd jobs ditcher Sherman Bridgers, 28; wife Susan, 26; and children Rosa L., 6, Willie, 4, Georgiana, 2, and Nathan, 2 months. In the 1910 census of Saratoga township, Wilson County: odd jobs farm laborer Jesse Price, 24, and wife Hattie, 23, and lodger John Floyd, 34, a widower and farm laborer. On 12 September 1918, Gen. Sherman Bridgers registered for the World War I draft in Wilson County. Per his registration card, he was born 19 March 1882; lived on route 4, Wilson; farmed for I.M. Washington; and his nearest relative was Willie Bridgers.